Republicans are now slated to hold at least 52 Senate seats when the next Congress convenes in January. MIAMI — Sen. Bill Nelson, D-Fla., conceded to Republican Rick Scott Sunday, giving the GOP at least 52 Senate seats in the next Congress. "I was not victorious in this race but I still wish to strongly re-affirm the cause for which we fought: a public office is a public trust," Nelson, who accused Scott during the campaign of using his post as governor to feather his own nest, said in a video statement. A defiant Nelson asked Floridians — his backers and those of Scott — to continue his battles to guarantee health insurance for people with pre-existing medical conditions, defend the environment and continue space exploration. "I ask you to never give up this fight," Nelson said. Nelson had privately signaled his defeat about an hour earlier, Scott had said in a statement. 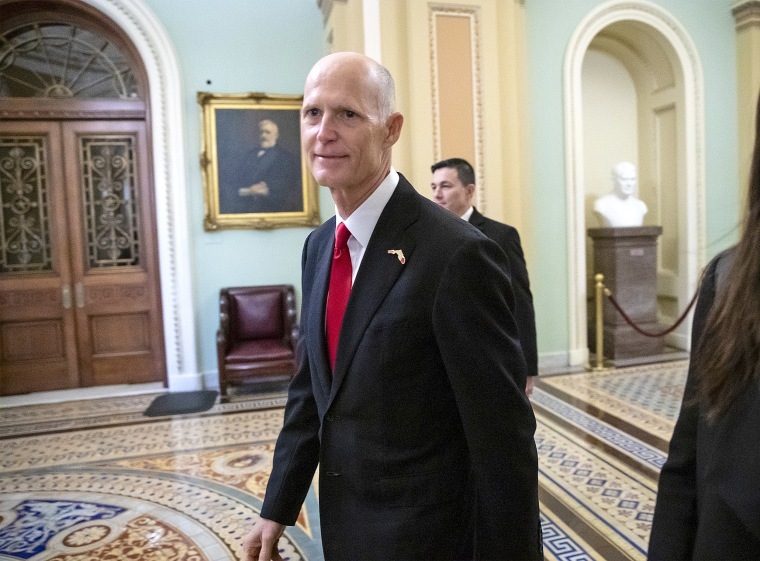 "I just spoke with Senator Bill Nelson, who graciously conceded, and I thanked him for his years of public service," Scott said. "This victory would not be possible without the hard work of so many people. Now the campaign truly is behind us, and that’s where we need to leave it. We must do what Americans have always done: come together for the good of our state and our country." President Donald Trump quickly congratulated Scott. "From day one Rick Scott never wavered," the president tweeted. "He was a great Governor and will be even a greater Senator in representing the People of Florida. Congratulations to Rick on having waged such a courageous and successful campaign!" Scott had held a 12,603-vote edge after a machine recount wrapped up earlier in the week, meaning the county-by-county manual version narrowed the gap by 2,570 votes. The state's 67 counties had to meet a 12 p.m. Sunday deadline to have their results counted. The addition of Scott will Senate Republicans 52 seats in the Senate and Democrats 47 seats in the next Congress, pending the outcome of a Mississippi special election that will be decided Nov. 27. And the close statewide elections in Florida — Republicans won the governors race by less than half a percentage point, too — will keep President Donald Trump and the eventual Democratic nominee heavily focused on the state's 27 electoral votes between now and the 2020 election. Democrats originally had hoped that Broward County, where there were roughly 30,000 ballots on which machines either picked up multiple votes on the same ballot for the Senate race or no vote at all in that contest — known as "overvotes" and "undervotes." They thought it was possible that the machines had erred and simply not read valid votes for the Senate race correctly. But Broward County updated its website shortly before noon Sunday with new numbers showing that voters had simply not picked a candidate in the race, perhaps due to the design of the ballot. After the hand recount, Nelson had picked up 495 votes in Broward compared to the totals originally submitted to the secretary of state, and Scott had added 142 votes. In the days after the Nov. 6 election, Democrats mounted a wide-ranging legal challenge to Florida election laws and the actions of state officials in what they said was an effort to ensure that every vote was counted.